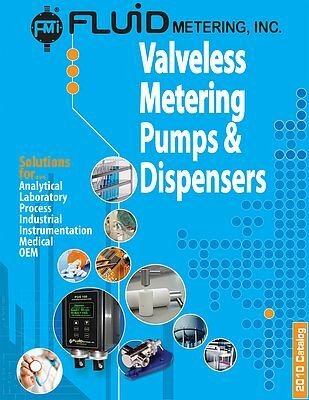 Fluid Metering, Inc. offers a full line of Dispensers and Metering Pumps for Laboratory, Industrial and OEM applications. FMI's unique piston-type positive displacement units feature no valves, low-dead volume, 1% accuracy and a ceramic/fluorocarbon fluid path.. Flows from 2.5 µl/dispense to flows of 4,600 ml/min with pressures to 200 psig. Fluid Metering is certified as compliant with ISO 9001 quality standards.